Seeking True North, Day 15: Iqaluit, NU, to Ottawa, ON. In 1999, a long-held dream of the Inuit people was realized with the creation of Canada's newest territory. Carving off the eastern 60% of the Northwest Territories, Nunavut spans three time zones and includes most of the eastern half of northern Canada covering a barren landscape of 734,000 square miles and accounting for one-fifth Canada's total area. Since this was designed as an opportunity for Inuit self-rule, the new government was mandated to protect and promote Inuit lifestyle and culture. 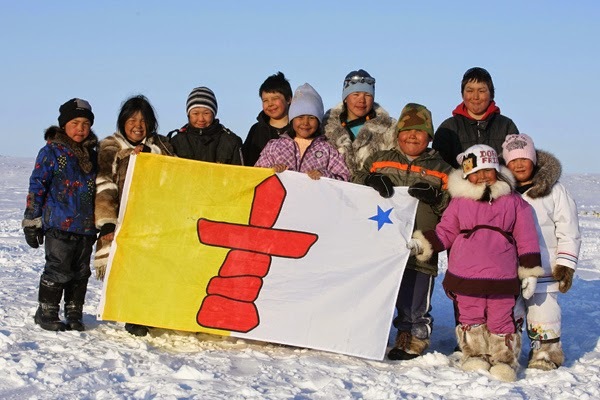 On paper, the territory of Nunavut brings together about 37,000 people in 26 far-flung tiny Inuit communities in an area three times the size of Texas, all north of the 60th parallel and with no roads connecting them. Territory-wide about 85% of the populace is of Inuit descent. 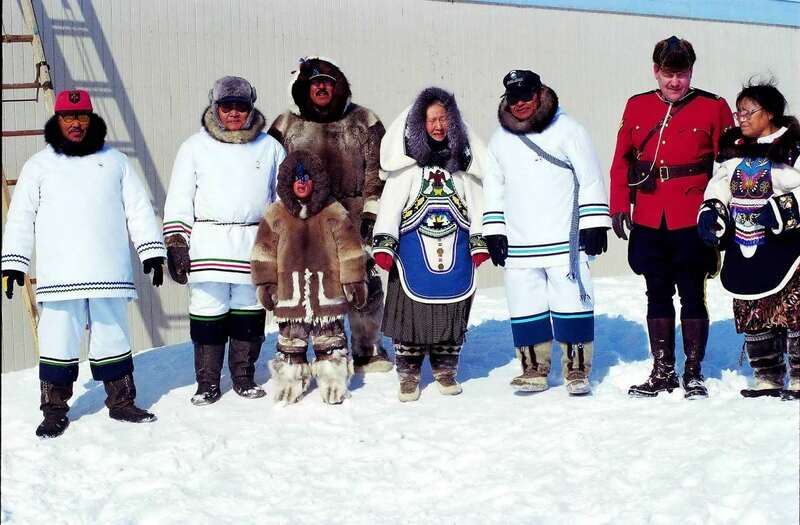 After many years of negotiation with the Canadian government and the government of the Northwest Territories, the Inuit people signed the Nunavut Land Claims Agreement (NCLA) with the other parties in 1993. • capital payout of $1.9 billion over 15 years. What appears at first blush to give the Inuit of Nunavut unique economic opportunities and political leverage has not provided the linear progression one might expect. Rather Nunavut flounders at the bottom of Canadian statistics in fulfilling the most basic needs of its people for education, housing, and adequate food. In other areas, Nunavut's statistics far exceed the national average, sometimes by as much as 1000%: drug and alcohol abuse, domestic violence, food insecurity, poverty, unemployment, illiteracy, child abuse, violent crime, and suicide. More than half of Inuit high school students drop out before completion. We would not pretend to understand the causes of this malady in a four-day trip, but extensive reading of works by people who have conducted lengthy research and observations suggests a familiar pattern of origin—the collision of a European-based culture with an Aboriginal one. Until the 1960s, the Inuit people lived in family groups in nomadic camps following the game that sustained all their needs for food, shelter and clothing. Over a period of several thousand years, they had successfully adapted their lifestyle to the cold and hostile environment of the Arctic tundra. With the land unsuited for agriculture, they mastered challenging specialized skills involving fishing, hunting and trapping. And they were very good at it. This nomadic hunter-gatherer lifestyle linked to the natural world allowed them to achieve self-sufficiency and live off the land. Once Europeans entered the Arctic area in larger numbers, the Inuit were under greater and greater pressure to abandon their nomadic ways and move into permanent settlements. During one period in the 1950s and 1960s, it is alleged that police conducted mass slaughters of Inuit sled dogs—their only means of transportation—to force them to move into settlements. This traumatic transition, accomplished in less than two generations, thrust the Inuit from their familiar partnership with nature—considered primitive by Western standards—into a modern sedentary lifestyle with permanent housing, snowmobiles, and satellite TV. A bit like putting a fish into a birdcage and wondering why it isn't thriving. The highly developed Inuit hunting and trapping skills—crafted over many generations—were of little use in this new culture. Indeed, after their living in settlements brought the traditional Inuit way of life under greater scrutiny, pressure was applied by international conservationist and animal activist groups to curtail the very activities the Inuit had depended upon for survival. A ban on seal hunting, in particular, stripped away one of their last reliable means to support themselves. In terms of the markers Westerners measure to determine quality of life, traditional Inuit nomads would have ranked very low. Thus, they started this staggering adjustment to modern culture at a crippling disadvantage, now being judged by standards unfamiliar to them. It's well and good to say that 85% of government employees must be Inuit (a goal which has never been approached, 50% being the highest achieved), but qualifications for most of those jobs require more education than most in the Inuit community have been able to achieve. Other forms of employment—construction, medical, retail, etc.—also require skill sets not learned in the traditional culture. Inuit unemployment often hovers around 20%, making this once proud people dependent on government hand-outs. The needs of the majority population are so great in this new arrangement that the territory began with an almost total reliance on federal funding. Even today, Ottawa provides more than $30,000 per capita in government subsidies to Nunavut, compared to less than $2,000 for Ontario. It is an ongoing tragedy of epic proportions. The capital city of Iqaluit (pop. 7,177) with its need for government employees has managed to recruit a large number of non-Aboriginals to the city with high salaries and generous benefits. Iqaluit's population today is almost 50% "transient." Not transplants, as we met in Yellowknife and Whitehorse. This distinction is important. Every single transient we met and chatted with, save one, indicated plans to stay a few years to accumulate money and return to their home in the south. Local wages represent the highest in Canada, but in Iqaluit, there is an enormous income disparity. Median income for transients is $86,000; for Inuit, $19,900. In Iqaluit, the amount of housing is inadequate and the cost dear. Many Inuit live in homes at three to four times the house's capacity. Those less fortunate live in shacks on the beach near the town dump. Obtaining adequate food is even more of a hurdle with the extreme costs. Federal subsidies have failed to deliver relief from food prices that are out of reach for the unemployed and underemployed. Almost three-fourths of preschoolers live in homes without enough food to eat. Is it any wonder that so many Inuit in their capital city are in a constant battle with despair? In our four days in Iqaluit, we observed very little interaction between Inuit and transients, as we had seen in Yellowknife, where the indigenous people seem to be well integrated into daily life. When we had the opportunity to ask the local Anglican pastor about our impressions, he asserted that there are areas where meaningful interaction occurs, and no doubt there are. Yet his church operates two services—one in English and one in Inuktitut—so that co-mingling isn't happening at church services. When eating in an Iqaluit restaurant, most of the customers are transients and tourists. Throughout the meal, Inuit walk through the dining room offering opportunities to purchase handcrafted bits of local art. Some are quite intricate, others more primitive. In our experience, this was the primary opportunity for conversation, but they had lots of tables to cover and understandably didn't want to linger. This Inuk artist gave us permission to take his photo. Sadly, this scenario has played out in places the world over where Western culture has tried to impose its 'advanced' standards on indigenous people. If there is a solution, we hope it finds its way to this tragic land soon. Challenges of Nunavut: Toronto Globe and Mail reporter Patrick White traveled extensively in Nunavut and wrote an insightful series of 2011 articles on the continuing challenges faced by this unique territory. If you're interested in learning more, part 1 of his "The Trials of Nunavut: Lament for an Arctic Nation" can be found here. Another excellent article from the London Guardian is well worth reading for anyone who wants to understand the problems better. And finally there's another article from the Toronto Globe and Mail: "Nunavut's Next Generation: The Kids' View on Life in Iqaluit." 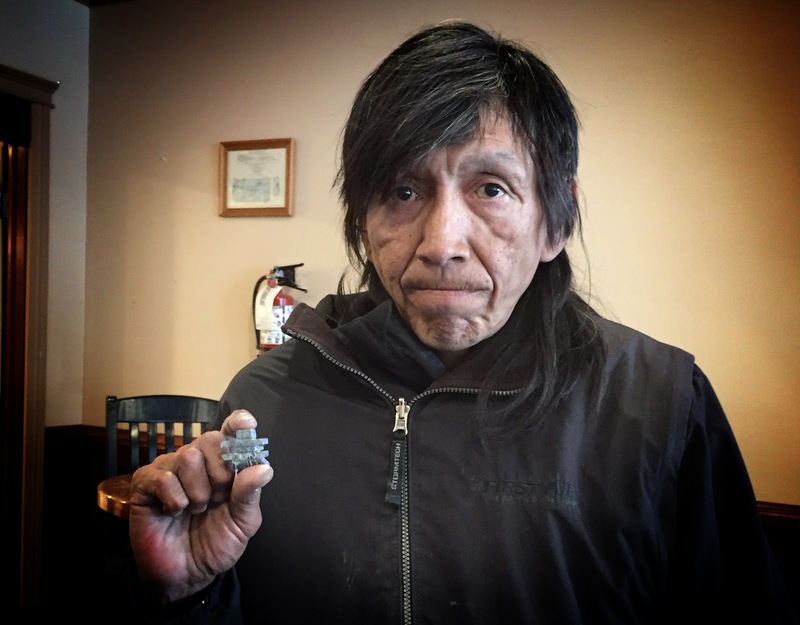 When in Nome: As we have learned, Inuit is the designation preferred by the indigenous people of Nunavut and other parts of eastern Canada, as they find the term Eskimo, pinned on them by outsiders and said to mean "eater of raw meat," to be offensive. In Alaska, on the other hand, Eskimo is still in use to include both the state's primary groups of native peoples—the Inupiat (an Inuit group related to the Canadian Inuit) and the Yu'pik, whose ancestors came from Siberia. And the Yu'pik are insulted if lumped together under the term Inuit. So you must remember and consider where you are.